The preliminary round of the 2012 FIBA Europe U18 European Championship for Women Division B has finally come to an end with eight teams still in the race for promotion. England and Hungary, the last teams to qualify, join Belarus, Bulgaria, Denmark, Germany, Lithuania and Portugal in the hunt for the three promotion places to Division A. The big matches of the day involved England and Hungary winning the matches that enabled them to dream on. In the first game of the day England beat Latvia (59-48) on the back of a big performance by Cheridene Green (in picture) who scored 22 points and picked up 10 rebounds. Latvia scored the first 5 points of the game but England responded with 10 straight points to take the lead for good after five minutes. Latvia tried to compete physically with England and did well in rebounding. However they did not have the energy to shoot and only hit 28 % of her shots. Ilze Jakobsone was the leading scorer for Latvia with 17 points. Hungary were given a tough time by Austria during the first 10 minutes (20-15). During the second quarter they were forced to switch to zone to finally pull away (34-24). During the third quarter the Hungarians played some of their best basketball to finally break down their opponents and cruise to victory (69-44). Amadea Szamosi was the leading scorer for Hungary with 12 points while also pulling down 7 rebounds. Her team-mate Janka Hegedüs (in picture) added 10 points. For the first time the Austrians had been in a position to challenge for a top 8 finish in this age group. They will only have 10 players next year in U18. In Group A, Portugal won for the third time in as many games in Strumica with a comfortable victory against Israel (70-40). Laura Ferreira had 20 points, 9 rebounds and 5 steals for the Portuguese. Portugal were trailing (17-10) after the first quarter but headed into the locker room leading (31-24). In Group B, Denmark huffed and puffed their way to a (69-62) victory over Switzerland behind with another strong performance by Maria Jespersen who scored 26 points. She also picked up 13 rebounds, was credited with 5 steals and had 1 blocked shot. 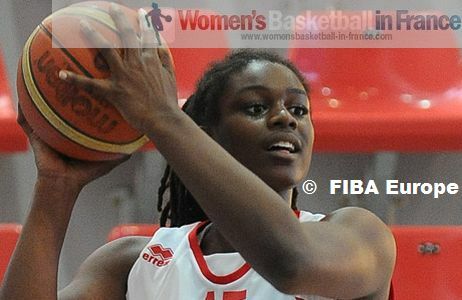 For Switzerland Laura Perrenoud had 13 points, 8 rebounds and 4 blocks in defeat. Finland closed the first phase with a victory against Norway (70-56). In Group C, Belarus had to work hard in beating Macedonia (48-42) and were grateful for the double-double of Hanna Kalenta with 14 points and 12 rebounds. In Group D, Ukraine won a low scoring game against Montenegro, (48-38). Miriam Uro-Nile from Ukraine was the player for the match with 12 points and 10 rebounds. Lithuania completed their group games by beating Scotland (82-58). In the second round in Group E Bulgaria, Portugal, Hungary and Denmark will battle it out while Germany, Belarus, England and Lithuania make up Group F.
The top two teams from each Second Round group clinch a place in the semi-finals while the bottom two will play classification games for 5th to 8th place.